Cooking up creative ways to stop invasives! 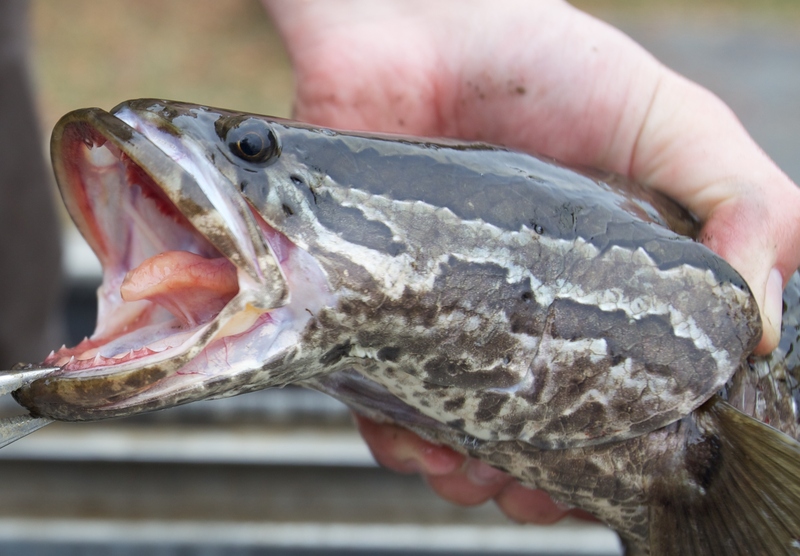 Northern snakehead first reared their nasty fins in the Chesapeake Bay watershed more than ten years ago, now we are fighting this foreign fish one bite at a time. Josh Newhard, a fish biologist at the Maryland Fish and Wildlife Conservation Office, shares his story of discovering creative ways to battle the spread of this aqua beast! Finding ways to control invasive species can sometimes feel like solving a complex puzzle. And putting the puzzle pieces together can often take the work of many people. Take for instance the northern snakehead, an invasive species of fish native to parts of Asia, but now with exploding populations in the Potomac River for over a decade. 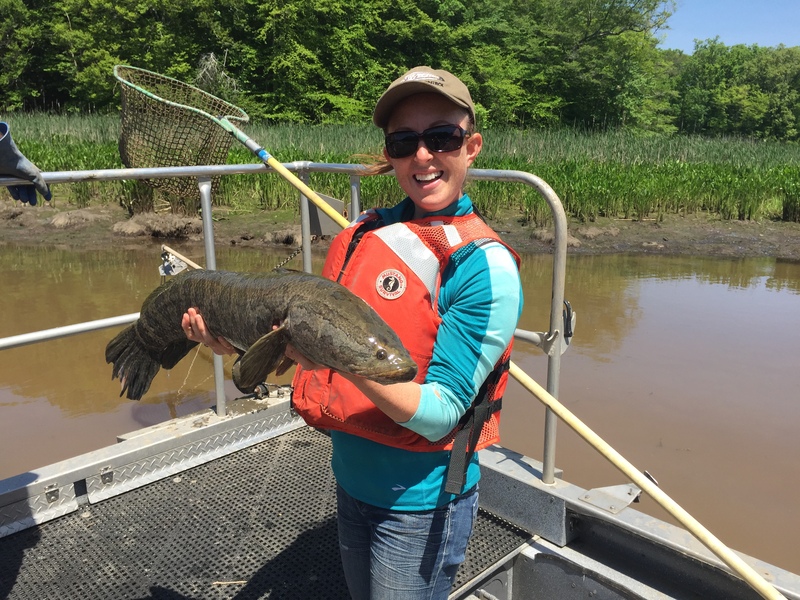 Fisheries biologists working in the Chesapeake Bay watershed are concerned that the snakehead’s predatory nature and prolific spawning behavior will lead to declines in native fish species and harm a delicately balanced ecosystem. 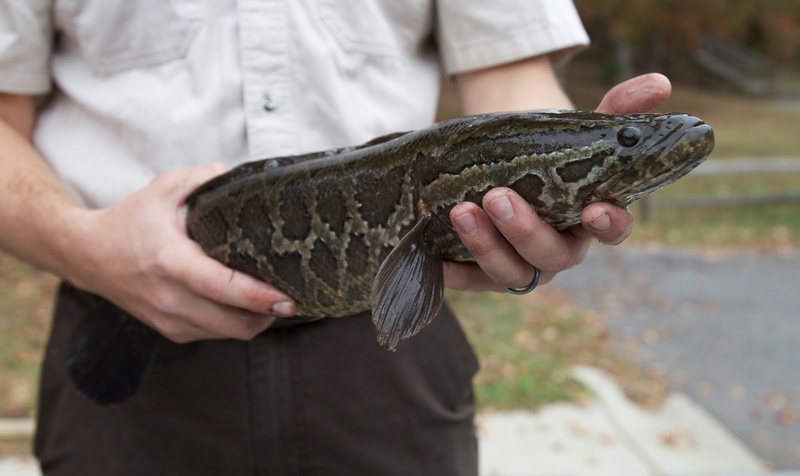 Since being discovered in 2004, the snakehead has continued to spread to numerous tributaries in the watershed, while growing in numbers in the Potomac River. Biologists with both state and federal natural resource agencies began efforts to control the populations using intense electrofishing surveys, but even these efforts did little to limit the spread and growth of the population. Other methods used to control invasive species include netting and trapping, but these methods also proved inefficient in targeting these feisty fish. By 2010, biologists decided it was time to try something new in this fierce battle to take back the Potomac. Queue up the recreational angler! After enlisting the public’s help in fighting this foreign invasion, the recreational fishing community responded in a big way! Fishing tournaments targeting the removal of northern snakeheads began popping up in many communities, and bowfishing enthusiasts took note of the opportunity to help the environment. 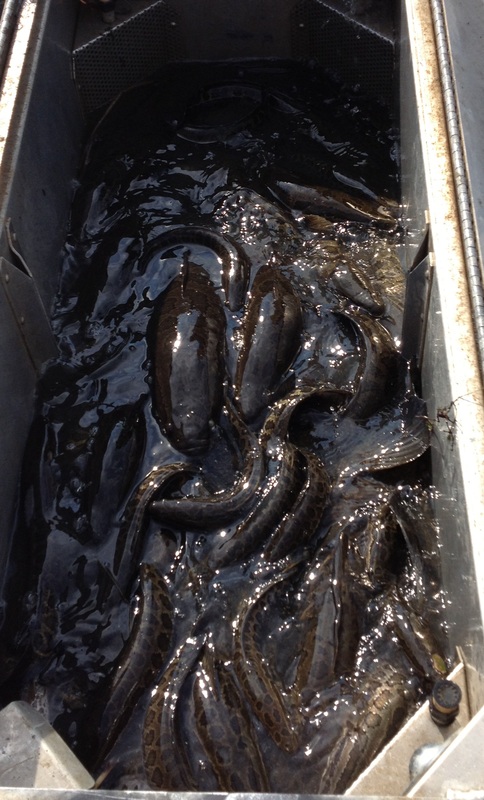 As the popularity of catching snakehead grew, restaurants began selling snakehead meat and even non-anglers were taking part in invasive species management. While this is in no way a fishery that management agencies want in the long-term, in the near future it is an opportunity to eat a tasty fish, all while feeling good about doing something beneficial for the ecosystem. It appears that these combined efforts of natural resource agencies and the public are beginning to show promise. In 2015, catch rates of adult northern snakehead were down in many places in the Potomac River, which is in part due to increased harvest by the recreational and commercial fishing communities. Only the future will hold if this trend continues, but for now, it is a downward trend that is welcome in the world of invasive species management. Watch us on Aqua Kids! Snakeheads on Maryland Outdoors, Maryland Public Television! Learn more about the Maryland Fish and Wildlife Conservation Office. 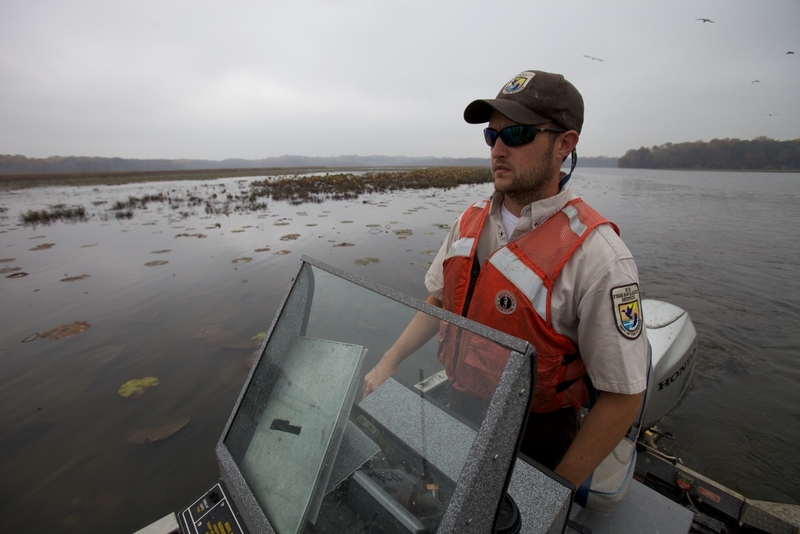 Read more about harvest incentives to control invasive species. This entry was posted in Blog entries, Fisheries, Invasive species, Outdoor recreation, Science and research and tagged Chesapeake Bay Watershed, Fish, fisheries, frankenfish, Invasive species, josh newhard, Maryland fish and wildlife conservation office, potomac river, Snake heads, snakehead, us fish and wildlife service on February 22, 2016 by U.S. Fish and Wildlife Service.